The Turret Attack features an iconic World War II style anti-aircraft cannon manned by two Allied infantry troops. This buildable heavy-caliber cannon measures 5.8 L x 3.8 W x 2.4 H in inches, can rotate a full 360° degrees and move over 90° vertically. It comes with seven artillery shells, with which to recreate immortalized scenes of legendary soldiers reloading the cannon and firing at enemy aircraft. 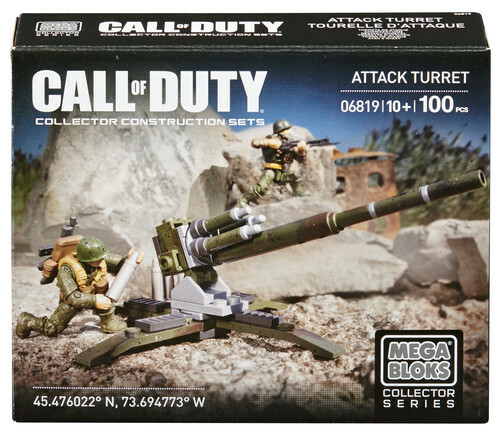 The Turret Attack includes two extremely poseable micro action figures and highly detailed, authentic interchangeable WWII accessories and weapons.